Remember when Victorinox Swiss Army Knives were THE tool to have if you were looking for multi-utility in a pocket-sized design. Back then, it seemed like the more they stuffed in between those red plastic handles, the more we coveted them. But the problem was, none of those neat little gadgets that	Victorinox was engineering into their pocket knives did anything particularly well. Or rather, none of the implements were ever strong enough to get any serious work tasks done. When Leatherman introduced their folding pliers design of a multi-tool in 1983, they ushered in a new era of truly usable pocket tools. Their "Pocket Survival Tool" was an instant hit primarily because its pliers feature was nearly equivalent in dimensions and usability to a standard full-size pair of pliers. Since their start over 25 years ago, Leatherman Tool Group, Inc. has steadily improved their product offerings. And, their Skeletool multi-tool seems to be nothing less than a culmination of everything they've learned over the last several years. The Leatherman Skeletool is designed to keep weight to a minimum while maximizing functionality and effectiveness. The name "Skeletool" is meant to imply bare bones as well as a lightweight skeletonized construction. It provides you with a knife, pliers/wire cutter, bit driver, and a bottle opener. Other multi-tools have a lot more features. 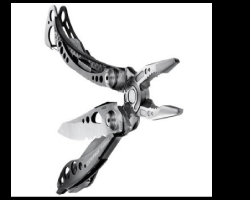 But, they're a lot bulkier than the Skeletool. And, many of their additional implements aren't commonly needed and typically aren't strong enough for true utility. Many other multi-tools have knife blades that are relatively sub-optimal when compared to modern, stand- alone pocket knives. However, the Skeletool has a large, robust blade that can handle serious cutting tasks. A great aspect of the Skeletool's knife is that it can be accessed without having to completely unfold the tool. It works just like a typical pocket knife. The Skeletool's universal bit driver offers a huge advantage over other multi-tools that have fixed-in- place flathead and Phillips heads. To change the Skeletool's tool bits, one simply pulls out one bit and then inserts another... just like you would with the universal bit driver you probably have in your toolbox. A spare, reversible bit is housed inside one of the Skeletool's handles. Th tool comes with a reversible Phillips #1 and #2 bit as well as a reversible 3/16-inch and 1/4-inch reversible flathead. The pliers implement is kind of in between a needlenose and a standard pliers. It is strong and highly usable set of pliers. A very capable wire cutter feature is integrated into the base of the pliers. There are two versions of the Skeletool available... the Skeletool and the Skeletool CX. The Skeletool CX is the more expensive one. It can be found online for about $60, whereas the regular Skeletool costs about $44. In our opinion, the extra $16 for the CX is worth it. 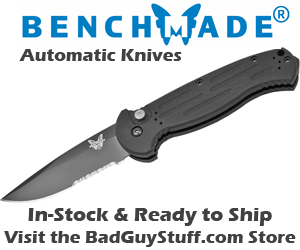 You get a blade that is made out of better steel (154CM), the knife blade is serrated, and the handles are tungsten coated for better corrosion resistance. However, the Skeletool is such a nicely engineered multi-tool that any guy would be proud to own either of the two variations.